Ever wonder why some people seem to feel less pain than others? A study conducted at Wake Forest School of Medicine may have found one of the answers—mindfulness. "Mindfulness is related to being aware of the present moment without too much emotional reaction or judgment," said the study's lead author, Fadel Zeidan, Ph.D., assistant professor of neurobiology and anatomy at the medical school, part of Wake Forest Baptist Medical Center. "We now know that some people are more mindful than others, and those people seemingly feel less pain." Mindful, eye? You get yourself in a state of stupor and market it as 'mindful'? 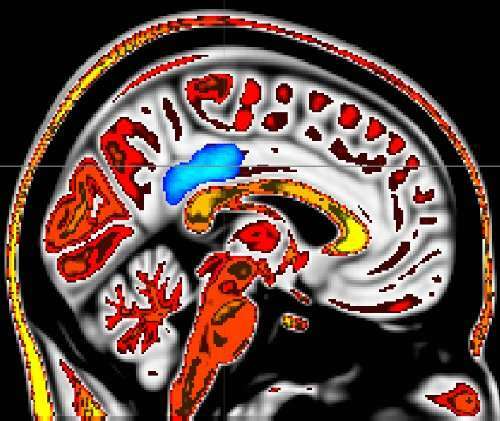 Obvious result: greater deactivation of a brain region called the posterior cingulate cortex. Feel less pain, think no thoughts. SO? Just spending a lot of effort and time to find a partial 'off' switch from life. Just call it 'mindless', because it is. Not a waste, but inconsistent with some other practitioners advice. I have heard to not resist the pain, as it is multiplied by this resistance. Clearly, like the emotional pathways, there are multiple configurations for C5 fiber inhibition and excitation. Pain with meaning, releases opioids in the brain, such as vagal nerve sympathetic systems tied to empathy. Where parasympathetic systems may disassociate. So speaking of neighboring vice and virtue, we can disassociate or wait. There maybe some discomfort, but you should not suffer. Isotropic accounts with operational difference, leaning in or tracing out. This fits into the whole idea of the "central commander" that is so much talked about in sports. "mindful meditation": When you are engaged in endurance or resistance sports you are doing a sort of "body scan" being aware of your whole body, perceiving some effects that may be felt by some as "painful" or as of extreme discomfort yet you learn to filter out these stimuli that are just a part of the exertion. This is why many complain about pain in the knees or directly call themselves injured while knees are perfectly fine and the "pain" is just the normal burn from exertion or the ITBS may just be a temporary swelling that a trained athlete will only pay a split second of attention. The default mode network (DMN), as the article points out, involves activation of the medial prefrontal cortex (mPFC), which is in contrast to the task positive network (TPN), which involves the dorsal lateral prefrontal cortex (dlPFC). The later is active in mindfulness while the former is active in self referential thinking. The two centers, mPFC and dlPFC have a reciprocal relationship, the activation of one inhibits the activation of the other. They also have opposing effects on the nuclei that express serotonin. The mPFC inhibits serotonin secretion while the dlPFC does not. One of he many actions of serotonin is inhibition of pain signal transmission from cord to cortex..